If you are worried about your confidential office documents are a mess around and get into the wrong hands, you may wish to ensure no-one rooting in your bins and able to take away the sensitive data for nefarious ends. 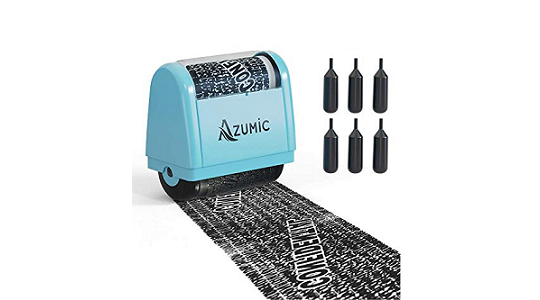 Azumic's wide roller stamp can cover sensitive information and the ink roller dries quickly saving your time in a paper shredder. Little quick isn't it? It's designed to cover sensitive information of your business or work documents. This confidential security protection roller stamp leaves no traces of important information when you no longer need that piece of paper. The roller stamp ink dries quickly ensuring total wipeout of information and making it non-readable, further saving a lot of your office time in comparison to those traditional paper shredders.